Original music featured in The Musical Album - Dorothy Parker's Room Enough For Two - a One Woman Show is written and performed by award winning composer Terrie Frankel. These memorable songs depict the life's journey of humorist/writer Dorothy Parker. 4. I Blew It Al! 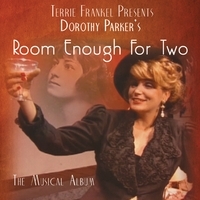 Dorothy Parker's Room Enough For Two - The Musical Album is a collection of all original songs featured in the One Woman Show written and performed by Terrie Frankel. This tour de force depicts the life of the highest paid female writer during the 1920's and 1930's - earning $5,200 per week writing screenplays in Hollywood. This Academy Award nominated screenwriter (A Star Is Born) also founded the Algonquin Round Table, The Screenwriters Guild and The Anti-Nazi League. A casualty of the McCarthy Era Communist Scare Blacklisting, Dorothy Parker returned to her roots in New York City and died penniless in the 1960's. From the opening song, "Room Enough For Two", through the humorous "I Blew It All", to "Fashionably Black List", to "Opening Night on Broadway", "Hollywood Holidays", "The Telephone Song" (after Parker's famed short story, The Telephone Call) to the energetic "Live While You Can", this album of all original music depicts Dorothy Parker's many successes, challenges and love affairs. I Love All These Songs Relating to Dorothy Parker's Life! I am a huge fan of Dorothy Parker and love listening to each of these songs, pinpointing times in her life when she was either in love, living in L.A. and New York - when her plays were on Broadway - when her friendship with fellow Playwright Lillian Hellman was in full bloom, and then on a downward ward spiral during the McCarthy Era persecutions - and above all her wisdom and cutting humor.... all of these things are portrayed in this uniquely original album of songs.